← Cheesy Cheddar Broccoli & Chicken. Wash the broccoli and cut into bite-sized florets; transfer to a large pot. Fill with just enough water to cover florets and add salt to season. Bring to a boil, then reduce heat to a simmer and cook until the broccoli is easily peirced with a fork, 5 to 6 minutes. Add yogurt, mayo, curry powder, salt, pepper and garlic powder to a medium mixing bowl. Coarsely grate the cheddar, set aside. When broccoli is done, drain well in a colander and add to a baking dish. Pour yogurt mixture over broccoli and top with cheddar cheese. Bake in the oven for 10 minutes. While broccoli mixture cooks, heat a skillet over medium-high heat. Pat the chicken breasts dry with paper towel and place on a plate; season with salt and pepper on both sides. Once the skillet is hot, add oil and swirl to coat the bottom. Carefully place the chicken breasts in the skillet; cook until the chicken is golden brown and cooked through (check doneness with a thermometer or cut into the chicken with a knife), 4 to 5 minutes per side. 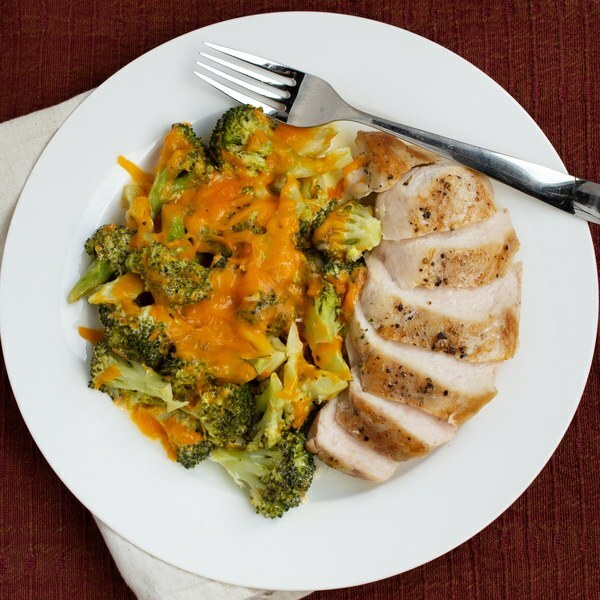 To serve, divide broccoli and chicken between plates. Enjoy!